The Danxia, or red sandstore, cliffs around Liming are a hikers' and climbers' paradise that is just now being discovered. Red Cliffs of Liming: View towards Lusheng village. 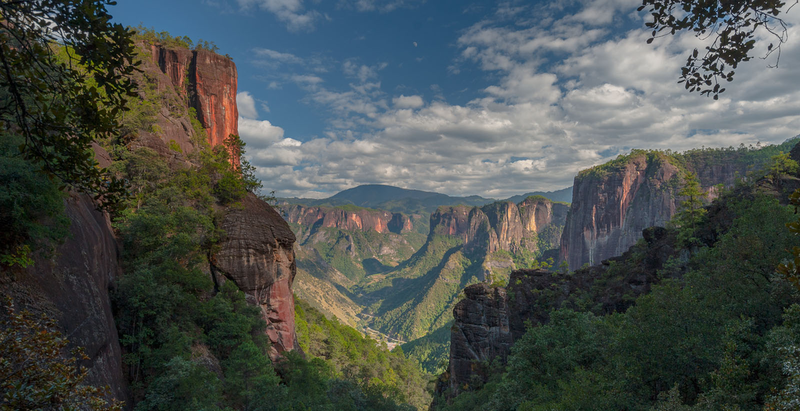 The sandstone cliffs around the small Lisu township of Liming offer some of the best scenery in Yunnan and the region is slowly developing into an international climbing destination. From Liming the road continues to Liguang, a cluster of houses some 4km south. From there a trail leads further south in direction of Laojunshan, while the road to Lusheng village goes due east. From the center of Liming, a trail, first steps, later a boarded walkway, leads up 600m past a number of viewpoints to the Thousand Turtle scenic spot, a long slope of turtle-shell shaped Danxia landforms. A second walkway, accessible about 1km from Liming towards Liguang, leads between the cliffs where two via-ferrata climbing routes are established. There is a Lisu church some 2km outside the park area just off the road to Zhongxin. Liming has plenty of so-so guesthouses, a climbers' favourite being Faraway Home 千里之外. Frequent minibusses go to the crossing at Zhongxin, from where it is easy to get transport to Lijiang. The Liming Visitor center has, when open, advise on climbing, but the main source is www.junshanclimber.com which publishes a detailed climbing book.